Prince William and Kate Middleton had a royal Indian dinner in the company of Bollywood biggies and business tycoons at Mumbai’s Taj Mahal Palace Hotel on Sunday evening. 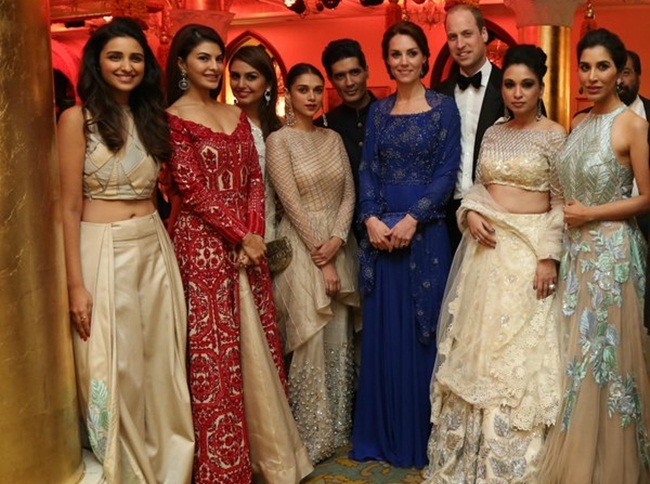 The Taj Hotels and Resorts had arranged the dinner gala in reception of the Royal Couple from Cambridge, England. The glittering evening of 10th April was full of entertainment for the Duke and Duchess as well as VIP invitees from Mumbai’s film industry and business niches. An Indian dance show on a number of songs from Bollywood films and an Indian fashion show were organized to introduce the Royal Couple to the cultural flavors of India. But it was the dinner menu that stole the show with Prince William and Kate Middleton at the Taj Mahal Palace Hotel in Mumbai. The dinner menu had the best of both vegetarian and non-vegetarian dishes from different Indian cuisines including some of the delicacies cooked in the kitchens of India’s royal palaces in the bygone eras. The menu started with an amuse bouche with orange caviar, which was followed by a Maharaja Thali in the next course. It was a most delicious feast for non-vegetarians among the guests at the reception of Prince William and Kate Middleton in Mumbai. 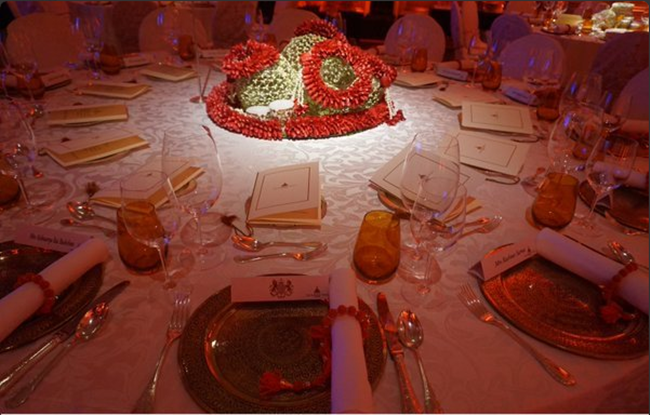 The main course dishes on the royal dinner menu included Ajwaini Macchli, Shahi Murg ka Soyota, and Kundan Kalia. These were served with Awadhi Gosht Biryani and Lucknowi Vegetarian Biryani. Shahi Murg ka Soyota is a dish of chicken morsels cooked in saffron-rich gravy of cashew nuts and sweet corns. Kundan Kalia is a spicy dish of boneless lamb with gold varq. The biryani was accompanied by boondi and mint raita. Since some of the invitees abide by the customary tradition of eating only veg food on nine days of Navratri festivity, they were served a grand vegetarian menu with mouthwatering dishes including Dal Langarwali, Paneer Shahi Korma, Khumb Makhana Mattar, Chhonka Palak, Subz Gandheri Kebab and likes. Subz Gandheri Kebab is a popular dish from the cuisine of Hyderabad while Paneer Shahi Korma is a delicacy from the kitchens of Nawabs in Lucknow City. The royal Indian dinner of Prince William and Kate Middleton at the Taj Mahal Palace Hotel ended with such traditional Indian desserts as Chhenna Payesh, Sharifa Kulfi and Dodha with Rabdi. Chhenna Payesh is one of the most popular Bengali delights from Kolkata. A team of 228 people including chefs and culinary experts made the dinner a memorable one for the Royal Couple and other premium guests. They did their best in everything from selection of ingredients, meticulous cooking and eye-catching presentation to courteous serving. Though it was a small menu with a limited number of main course dishes and desserts, the team made sure that each and every item tasted the best. The guests were served on silver platters with silver cutlery as per the royal dining traditions. The sumptuous feast in the reception of the Duke and Duchess was attended by Bollywood biggies from the entertainment industry of India, including Shah Rukh Khan, Aishwarya Rai, Madhuri Dixit, Rishi Kapoor, Karna Johar, Sonak Kapoor, Farhan Akhtar, Anil Kapoor, Alia Bhatt and likes. Prince William and Kate Middleton visited the India Gate and the Gandhi Smriti Museum in New Delhi. 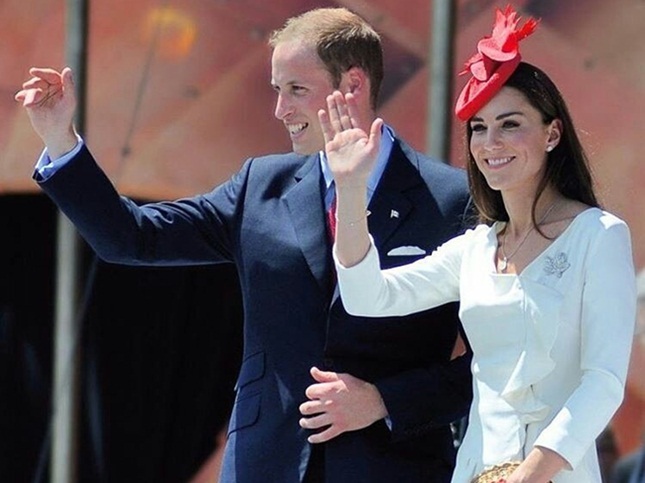 Read more about the Royal Couple’s itinerary in India. Travel Beats is a digital portal for Indians and NRIs by IndianEagle, a leading travel organization. Travel Beats publishes interesting stories and news about travel, culture, entertainment, lifestyle and aviation from India and the US. Nice post indianeagle.com , real nice stuff.